Well, we finally started our tour of three Arizona observatories and in this part 1 can report on our journey from southern California through Phoenix to our first astronomy stop in Safford, AZ and Mt. Graham. So along the way, we passed some dome like Observatory structures in the distance that turned out to be the Palo Verde Nuclear Generating Station. Hmm, I guess that is close enough for now! Onward and onward we go until we spend the night in Phoenix and look up my Big Brother, Richard. So, here we are saying good bye to the restaurant mascot. Heading toward Safford, AZ, and the terrain changes from flat desert to big conglomerations of beautiful rocks. Finally, our first Observatory target can be seen high in the near mountains of Mt Graham. The Observatory, which turned out to be the Large Binocular Telescope, is just the little white box structure in the mountain notch. The number of visitors to the three observatories on Mt Graham are limited in order to protect the endangered red squirrel, so we joined up with a group sponsored by the Eastern Arizona College (EAC), who provide a passenger van ride up the 90 minute twisting, hairpin curves, bumpy, washboard of a road up the mountain. The EAC coordinators and docents do a great job and the tour includes a box lunch in the forest. Ok, so after the bumpy ride, going through the washed out sections of the road and passing many sections that were burned out by the recent forest fire, which barely missed the observatories, we finally were able to survey the observatories. Here Resident Astronomer Peggy and I are standing in front of the Vatican Advanced Telescope with the sub millimeter Radio Telescope and the Large Binocular Telescope behind us. I forgot to take a photo of the VAT, but you can check out this photo image from Wikipedia. Inside is an alt/az Mount Scope with a 1.8 meter mirror. The mirror was the first technical demonstration of making a large mirror by spinning the molten glass, which assumed a parabolic shape. This innovation by Dr Roger Angel proved to be very advantageous and is now being used to make many of the much larger mirrors now being fabricated. The next Observatory we toured inside was the 10 meter diameter dish antenna which is used to study radio astronomy in the sub mm wavelength range, which corresponds up just about one terahertz. The radio Telescope is used to receive just one pixel worth of data, at each wavelength of interest, at each position at which it points. The operators then move the scope to the next pixel location and repeat the data acquisition operation. In the image below you can see some of the electronics used to collect the radio signals. The largest telescope on Mt. Graham is the Large Binocular Telescope. The LBT Observatory was all closed up for maintenance on the day that we visited the facility, but this Wikipedia image shows the LBT with door wide open. Moving on to the inside tour of the Large Binocular Telescope Observatory, our first loom is in the receiving hall where the large 8.4 meter mirrors are re aluminized and hoisted up to the Telescope mount. The big red circular door is the vacuum chamber used to recoat the mirrors. Here you see one of the two mirrors in the stowed horizontal position. The Observatory was busy doing some maintenance and recalibration and we were not allowed down on the Observatory floor. But up on the observation deck we could see the transition area between the stationary part of the structure and the rotating part of the protective dome. This next screenshot, copied from a professional research paper, shows how the images from the two mirrors of the Binocular system are combined so that the Telescope functions as an interferometer with about 28 meter interferometric length. This capability enables the capturing of images of exoplanets orbiting their star. I’ve seen that image before and will look it up for review in the next post. The exoplanet survey conducted at Mt. 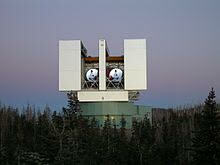 Graham, using the LBT, known as LEECH (LBTI Exozodi Exoplanet Common Hunt) was the result of a 130 night observing run. The exoplanet detection is shown in the following figure, abstracted from the referenced paper. Our tour included a look at the Observatory Lounge and kitchen and the control room. The photo below shows the Telescope operator’s console. It’s all about multiple computer screens. Even the Astronomer just looks at computer screens. No eyepiece observing here! Finally after we returned to Safford for dinner, we had to venture out and find a dark sky sky just a mile out of town. 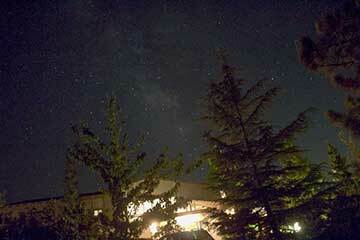 Wow, as soon as we got out of the car, we could see the Milky Way. It looked so beautiful! I had brought my lightweight polar tracking mount for the camera, but elected to just crank up the ISO to 3200 and beyond and just take 30-35 second exposures with the DSLR with 10mm lens. In this image, the foreground trees were periodically illuminated by cars coming down the road. But it looked pretty good and it was great just watching the Milky Way with our own eyeballs. This photo is really just an IPhone photo of the Liveview DSLR screen. When we get back to the Observatory, we can do some real processing. Ok, in the morning, we will continue driving down the road to our next stop in Tucson, AZ, where we plan to get some real Telescope observing at Mt. Lemmon and at Kitt Peak.